Poloncarz claims threat to life, immediately receives taxpayer-funded personal protection. Average citizen claims same, is forced to beg a judge for permission to exercise fundamental right to self-defense. 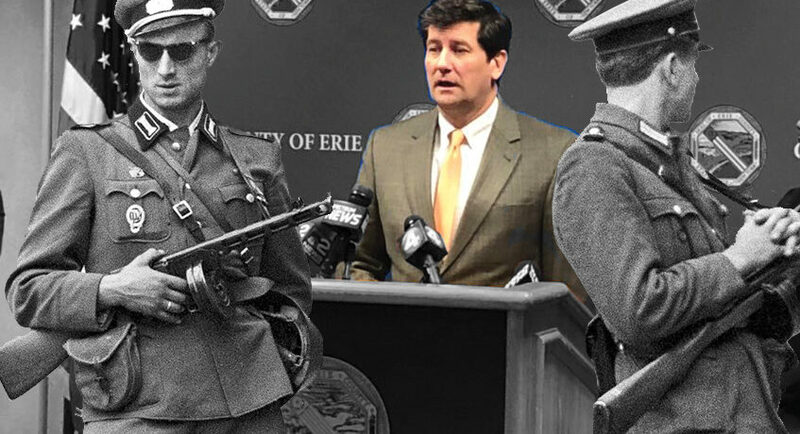 April 3, 2019 | BUFFALO, N.Y. –The Buffalo News reported Tuesday that Erie County Executive Mark Poloncarz is traveling to scheduled events with a personal security detail composed of Erie County sheriff’s deputies. Apparently, midway through last month, Poloncarz received a suspicious package at his office and experienced an alarming incident at his home for which he called police. Responding to these events, Poloncarz authorized his own taxpayer-funded personal protection detail, a game-changing self-defense benefit reserved exclusively for privileged progressive NY bureaucrats like himself. The process of requesting a New York State pistol permit takes place in the context of a single county official’s sole discretion, which is applied arbitrarily and inconsistently, resulting in entire classes of New Yorkers being denied their fundamental right to self-defense. This week’s revelation that, when progressive NY politician Mark Poloncarz feels threatened he’s granted a taxpayer-funded personal security detail, but when the average Erie County resident feels threatened he has to kneel before a judge and request permission for self-defense, demonstrates the unacceptable danger and unconstitutional overreach that New York State’s ‘may issue’ pistol permitting system imposes on Western New Yorkers, and the state in total. Therefore, the pistol permit regime must be overturned, and 2AWNY.COM is working diligently with Attorney Jim Ostrowski to achieve this end in the U.S. Court of Appeals for the Second Circuit. Unconstitutional – Second and Fourteenth Amendment rights of New Yorkers violated. Overly subjective nature of “good moral character,” “good cause,” and “proper cause” requirements in New York State’s pistol permit scheme. Application of “intermediate scrutiny” to Second Amendment restrictions when “strict scrutiny” is most appropriate for the fundamental and constitutionally enumerated right to individual self-defense. A decision on this case is still pending, though the court hinted during oral argument that it will likely await guidance from the U.S. Supreme Court on the appropriate level of judicial scrutiny to apply to Second Amendment cases before issuing a ruling. This guidance is expected to come via NYSRPA v. NYC, a case pending U.S. Supreme Court review that is likely to be heard in October 2019. To learn more about any of the above, please contact Steve Felano at (518) 852-1863 or sfelano@2AWNY.com. 2AWNY is a force multiplier for the numerous Second Amendment civil rights advocacy enterprises forming the backbone of Western New York’s vibrant gun culture. We act as a 2A news and information distribution, policy analysis, and organizational driver for the many interest groups seeking to defend and expand Second Amendment civil rights throughout the region. 2AWNY is dedicated to assisting in the organization, promotion, and funding of legal challenges to the unconstitutional New York State gun control regime. We seek to make Western New York the epicenter of New York State’s Second Amendment civil rights renaissance. Learn more at WWW.2AWNY.COM.